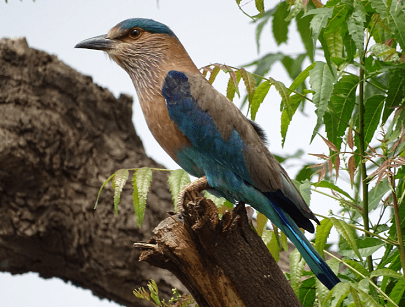 State Bird of Andhra Pradesh – complete detail – updated. Description of State Bird of Andhra Pradesh. 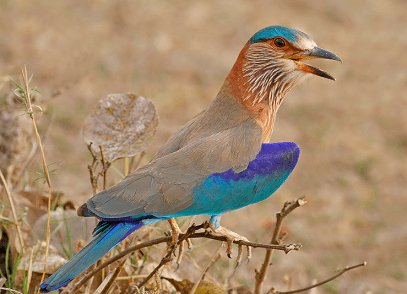 Name of State Bird of Andhra Pradesh is Indian roller. Classification of Indian roller. Habit and habitat of Indian roller. 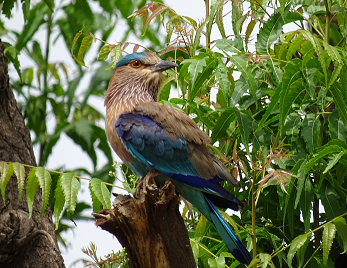 Indian roller, generally found in cultivation, thin forest and grassland. They are mostly found near the edges of the forest rather than deep forest. They are also spotted in urban and suburban areas. The crown and vent are blue. In flight the primaries and secondaries show bright shades of blue. The breast of Indian roller is brownish. Eyes and bill are black. The throat and upper breast are purple in color. The back and abdomen are gray in color. Males and females are similar in appearance. The primaries are deep purplish blue and the tail is sky blue and the central feathers are dull green in color. The neck and throat look like purplish lilac with white shaft streaks. The bare patch around the eye is ochre in color. They have strong black bills…………..
Indian Roller is a omnivorous bird. The Nesting and breeding season ranges between February to May. They build their nest at a height between 3 to 9 meters. They use sticks, barks, leaves, roots, twigs and grass to make a cup shaped nest. A group of Indian rollers including one female would gather on top of a tree. Female lays three to six blue, green or yellow with spots of brown and grey in color eggs at a time. She lays eggs in tree holes and other similar places. The incubation period of the eggs last for about 16 – 21 days. The male shares this incubation duty……….. The throat and upper breast are purple in color. The back and abdomen are gray in color. Males and females are similar in appearance. The primaries are deep purplish blue and the tail is sky blue and the central feathers are dull green in color. Indian Roller is omnivorous bird. Generally, they feed on nuts, seeds of trees, shrubs and grains, grasshoppers, insects, arachnids, small reptiles (including Calotes versicolor and small snakes), earthworms, millipedes, snails, spiders, amphibians, crickets, butterflies and moths. They also take frog, dead and injured small vertebrates as their food. A group of Indian rollers including one female would gather on top of a tree. When the female starts flying, she will be followed by the males in the group until she lands in another location. The male will show off his interest by nodding his head up and down. Then, the female will choose her mate among the male blue jays and leave the group. The male strengthens their bond by providing food to the female. By this manner, the female tests the male’s ability to get food for their future family. The male also brings special twigs and other things to build the nest. These are carefully examined by the female before putting in their prospective nest. Female lays three to six blue, green or yellow with spots of brown and grey in color eggs at a time. She lays eggs in tree holes and other similar places. The incubation period of the eggs last for about 16 – 21 days. The male shares this incubation duty with the female. In this time, the male brings the food for his mate. After three weeks, the young ones can feed themselves. The young ones will stay with their parents until they are two months old and then they will leave their nest. 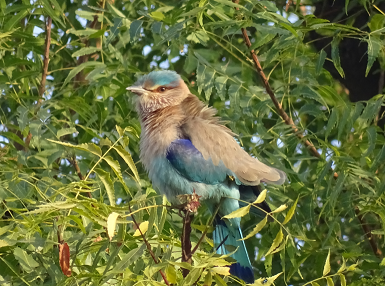 The life span of the Indian roller exceeds up to 18 years of age. Thanks this site is giving nice & Useful Information about birds. ?? ? ?